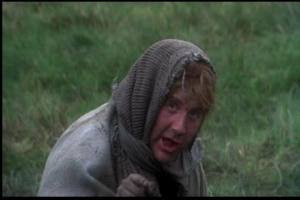 Just as Dennis, the "old woman" who was actually a man in Monty Python and the Holy Grail, would point out, 37 is "not old", and is not much time until our opening night on Thursday, February 4. We are proofing the printed program, and getting files ready to load to the online schedule which SHOULD be ready before the New Year starts. So stay tuned! In the meantime, we hope you are enjoying the Take 5 series. A glitch beyond my understanding means that when Melanie's postings show up on our website's front page, the text is black on a black background, whereas mine turn out "normal". But I can tell you that it has been reported. Until then, if you highlight the text, you can read it. Or click on the Blogger "B" icon. Sorry about that.